Neža Knez: Square, 2018. Performance, video, installation. Brooklyn, NY. Over the course of the evening, YVAA awardees/ RU artists Neža Knez and Nadežda Kirćanski will stage and discuss existing crossroads in their distinct practices involving performance and intervention. Both artists will debut a new performance piece created in response to Brooklyn and their association with their current habitat in the Brooklyn area as “foreigners” occupying physical and ideological space. Knez will examine ideas of repetition, hygiene and labor, while Kirćanski’s intervention will disrupt the chaotic equilibrium in the opposite direction. 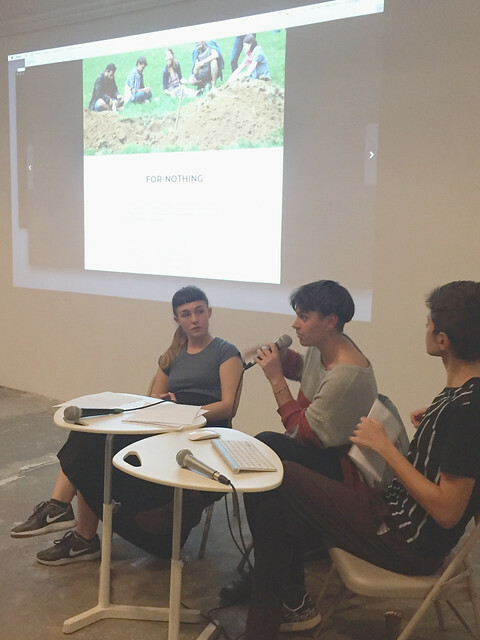 The New York based curator Osman Can Yerebakan will lead the ensuing discussion and Q & A.
Nadežda Kirćanski (1992, Zrenjanin) is a visual artist based in Belgrade. She graduated from the Faculty of Fine Arts in Belgrade, department of Sculpture, where she currently pursues her PhD degree. KIRĆANSKI mostly organizes her artworks as ambient installations, thus including multiple elements (specific place, light, objects, smell) that form overall experience. Awarded with the “Sreten Stojanović, professor of AFA” Award for achievements in sculpture in 2017. and the “Young Visual Artist Award - Dimitrije Bašičević Mangelos” Award for young conceptual artist for 2018. See the exhibition history here. Awarded the 2018 OHO prize for emerging visual artists in Slovenia - Neža Knez works in diverse media ranging from audio, video, photography, drawing and classical sculpture. She views her practice as a "sensorial research of perceptions with different senses, playing with visibility and invisibility, dealing with the question of the (thinking) body. I am interested in connections between body, voice and senses, their relation to the space, their communication with objects and people in it. I am looking for something »in between«, some kind of emptiness, elusive »blind spots« that could never be caught in language or representation." See the exhibition history here. Osman Can Yerebakan is a New York-based art writer and curator. Among his fields of interest are fluid states of audience interaction, kinship between literature and fine arts, and performance of identity as political declaration. He organized exhibitions at The Clemente Center, La MaMa Galleria, Radiator Gallery, Equity Gallery, AC Institute, Center for Book Arts, Local Project, UrbanGlass, and Leslie Lohman Project Space. His writing has appeared in New York Times: T Magazine, Village Voice, The Paris Review, Brooklyn Rail, BOMB, CULTURED, GARAGE, Harper's Bazaar Arabia, Galerie Magazine, Amuse, Elephant, and L’Officiel. This program is made possible with support from The Trust for Mutual Understanding.